Last Monday I was invited to a very exciting event at one of my favourite publishing houses. It was the first time I'd been invited to such a thing and I had absolutely no idea what to expect. Especially when it turns out I'd been surrounded by proper journalists and official-people-working-in-the-book-industry! And me, just a lowly book blogger! Luckily, everyone at Penguin are super nice and made me feel at home and I ran into some very friendly faces... Michelle from Clover Hill Book Reviews, who seemed just as nervous as I was, Carly Bennett from Writing from the Tub and Liz from My Favourite Books. I love meeting and re-meeting some of my favourite bloggers! After some tea and (lovely) biscuits, we were ushered into another room where the presentations were being held. We were taken through an entire year of fabulous books that Penguin will be publishing, watched book and movie trailers and heard some really interesting and sometimes hilarious talks by some very exciting authors, both debut and established! I was so excited to take loads of photos beforehand, but when it came time, I only ended up with one photo as I was just so interested in hearing what the authors and people at Penguin had to say. Here's my one photo of Meg Rosoff (SQUEEEE) talking about her new book, There Is No Dog, which is out in August. The book sounds absolutely brilliant and I cannot wait to read it. She talked a bit about the cover and the meaning of the title, which has left some confused. The thing I found most interesting about what Meg Rosoff had to say was that it was really difficult for her to write this book, feeling very nervous. Seems a case of insecurity hit, which surprised me, but I guess it shouldn't have. After the presentation, we all had lunch together and everytime Meg Rosoff walked past me I started fan-girling 'MEG ROSOFF JUST WALKED PAST!' etc - and then we were introduced and she is so lovely to chat to. Was wonderful to meet her and talk to her a bit about her books. 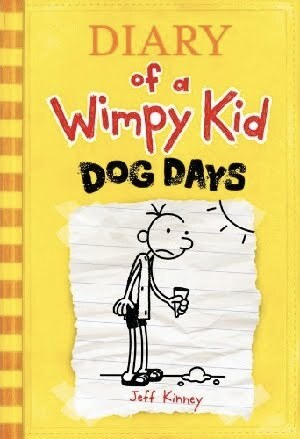 Then there was bits about the Diary of a Wimpy Kid books (I've only just watched the film this afternoon, HILARIOUS) followed by the film trailer for the new movie. Holy crap, how much do I want to see that now?! 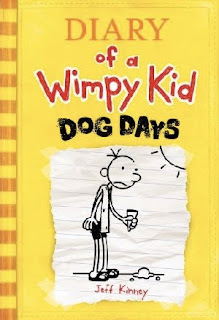 The latest book, Diary of a Wimpy Kid: Dog Days is out in February, with other books out later in the year. Then we went on to hear about the brothers Alex and Simon Scarrow! February sees the arrival of a new series of Roman gladiator books from Simon and the third Time Raiders book from Alex. History never looked like so much fun before :) I'm going to really speed through the next bits here, or we'll be here all day. Jeremy Strong spoke to us! He really championed this new Campaign For Fun that he's doing, trying to bring fun back into learning. I think it's a brilliant idea and I wish him all the very best with it. 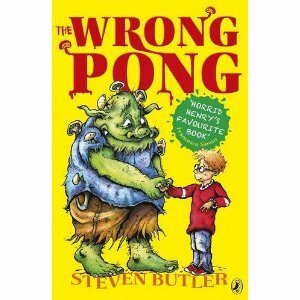 This was followed by a talk by a new author, Steven Butler, who was very funny and talked about his new series of books for younger children, The Wrong Pong. Then James Holland, author of a new book out in June, Duty Calls: Dunkirk talked a bit about why he wrote this book and how he hoped it would help. I must admit, the story of an ordinary boy fighting in WWI definitely sound appealing to me. There was mention of a graphic novel of Richelle Mead's first Vampire Academy book (intriguing!) A new book by Kami Garcia and Margaret Stohl out in November (will give me enough time to read first two books!) and the new series of books in the Vlad Tod series by Heather Brewer! This was followed (are you still with me?!) by Matched by Ally Condie. 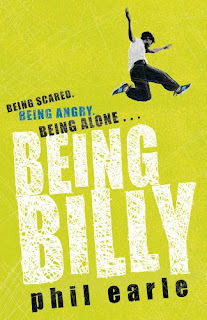 The paperback is out in July and Crossed is out in November! (DYING to read Crossed!!) followed by Across the Universe by Beth Revis! This is my most anticipated read so far! Looks absolutely fabulous and is published (as you well know!) in March. Already I'm thinking 'wow' at all the information that's been thrown at me, and then they introduce David Almond! Who read from his new post-apocalyptic book entitled The True Tale of the Monster Billy Dean, out in September, and I swear to you all, the whole room absolutely hung upon every single word out of David Almond's mouth. I could sit and listen to David Almond talk forever. Wonderful experience. And then we heard from debut author, Phil Earle, author of Being Billy, a book I read and loved recently. He talked a bit about working in a care home when he was younger, some of the difficulties and successes of some of the children he was involved in caring for. I nearly cried again. I've been chatting a bit with Phil Earle on twitter, so it was lovely to hear him speak and chat to him after the event! We went through some of the beautiful picture books coming out this year, and some of the pre-school titles and baby books. While *I* found this interesting, as I have a pre-schooler myself, I'll skip through some of it. The last thing I DO want to mention however, is that there was mention of Ladybird Live, which sounds a bit like a story-telling tour that will be happening this summer with fun activities and the possibility of celebrity story-tellers. It's something I'm very much interested in and something I think both my boys would love to go to. When I get more information, I shall let you know! So that is how my day went! Sorry if this was a bit long-winded! I'm just very excited by the authors I heard speak and who I was able to chat with. I was excited about hearing the new bookish news from Penguin and for being invited to such a fun event. The spring rolls at lunch were particularly delicious and thanks to Carly and Liz for keeping me company! I was able to put faces to some of the lovely Penguin women who I've been emailing with and of course, I came home with a very generous goody bag and a whole stack of books to keep me busy reading for awhile. I love you Penguin. Thank you for inviting me and hosting such an incredible event! That sounds like an amazing event. I'm really curious to find out more about Meg Rosoff's new book, and I don't blame you at all for being fangirly. Since I haven't read the Vampire Academy series and can't see myself having time to catch up in the near future, I'm especially intrigued by that mention of a graphic novel. Interesting stuff! Oh, it sounds wonderful! I'm exactly the same when I meet authors! Thank you for this brilliant write-up. So it looks like you had a fantastic time! I'm jealous you got to talk about Crossed--can't WAIT for that!!! And the new Sean Olin book! I read his book Killing Britney a while ago and thought it was great. This sounds like a great event - I was gutted that I couldn't stay down in London longer and attend myself. I love Meg Rosoff, in particular, and am curious about her new book. Also, the Charlie Higson books are excellent and you must, must, must give Rick Riordan a go (start with Percy Jackson - the series really is great fun). Glad you enjoyed it and thanks for such an informative post on future titles. Lauren - It was an amazing event! I should have said, the Meg Rosoff book is going to be a funny book about a teenager who is God. The title is apparently a reference to a joke about a dyslexic athiest sign! Sya - Aww, it would have been great to meet up with you! Will definitely pick up Percy Jackson sometime this year, promise! I was hyperventilating at just the thought of seeing all those authors. Glad to hear you had a good time. Didn't realise there would be lots of journalist there too. Scary! I'm so upset that I couldn't come and meet Meg Rosoff. She is amazing. Glad you had an amazing day though. Lovely feedback from the day, I also thoroughly enjoyed it. Sadly I couldn't stay long afterwards to talk to authors, but all the trailers and presentations by the authors were fantastic...I'm really, really looking forward to the treats Penguin are bringing to readers this year! Viv - I didn't even think what 'media presentation' meant actually. Sounds obvious now but I did feel a little bit intimidated :) Still, fun day. Mariel - I KNOW! :) I'm still thrilled with it all.